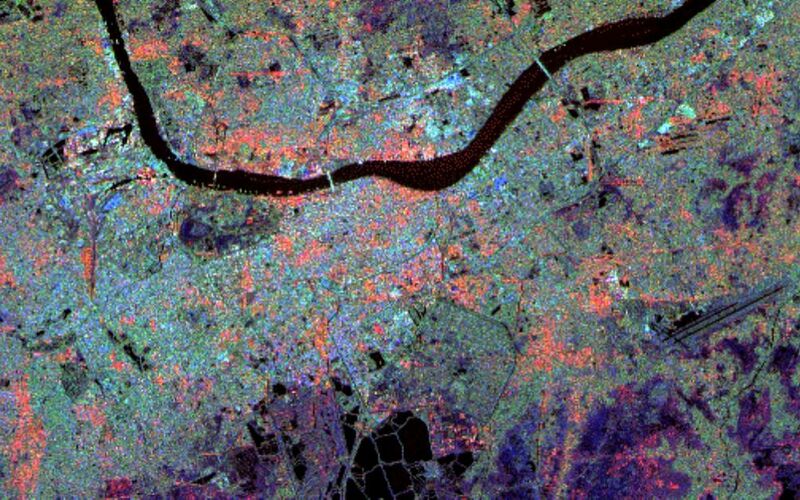 This radar image of Calcutta, India, illustrates different urban land use patterns. 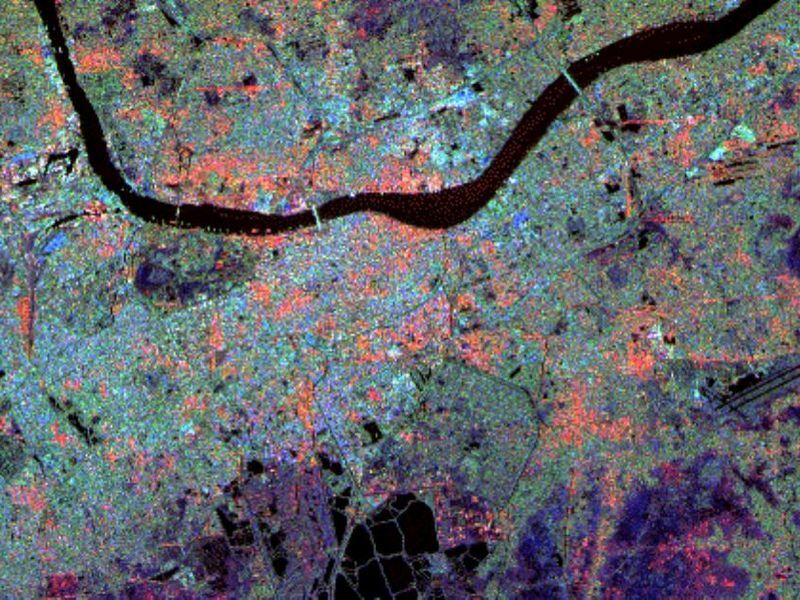 Calcutta, the largest city in India, is located on the banks of the Hugli River, shown as the thick, dark line in the upper portion of the image. The surrounding area is a flat swampy region with a subtropical climate. 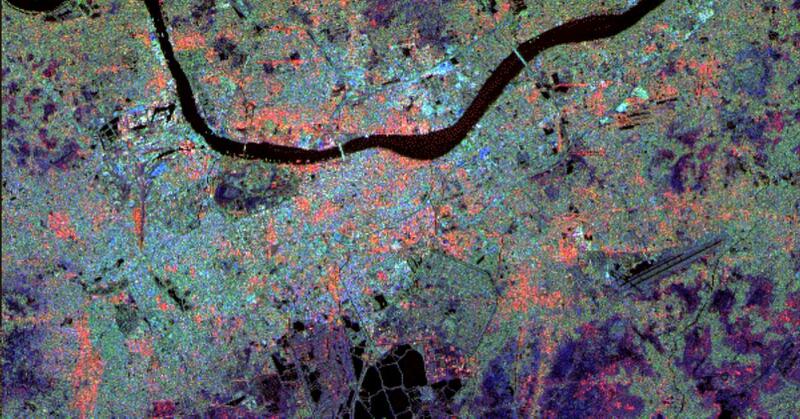 As a result of this marshy environment, Calcutta is a compact city, concentrated along the fringes of the river. The average elevation is approximately 9 meters (30 feet) above sea level. Calcutta is located 154 kilometers (96 miles) upstream from the Bay of Bengal. 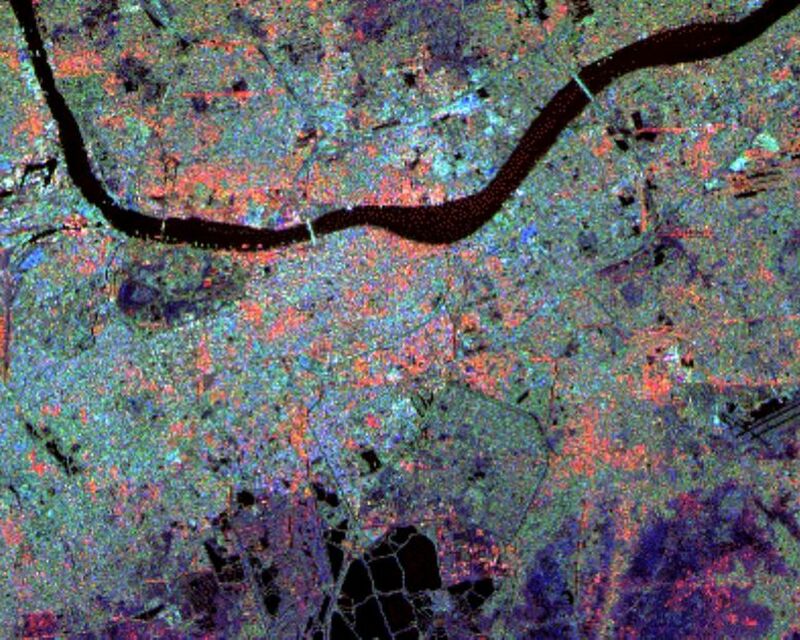 Central Calcutta is the light blue and orange area below the river in the center of the image. The bridge spanning the river at the city center is the Howrah Bridge which links central Calcutta to Howrah. The dark region just below the river and to the left of the city center is Maidan, a large city park housing numerous cultural and recreational facilities. The international airport is in the lower right of the image. The bridge in the upper right is the Bally Bridge which links the suburbs of Bally and Baranagar. This image is 30 kilometers by 10 kilometers (19 miles by 6 miles) and is centered at 22.3 degrees north latitude, 88.2 degrees east longitude. North is toward the upper right. The colors are assigned to different radar frequencies and polarizations as follows: red is L-band, horizontally transmitted and received; green is L-band, horizontally transmitted and vertically received; and blue is C-band, horizontally transmitted and vertically received. The image was acquired by the Spaceborne Imaging Radar-C/X-band Synthetic Aperture Radar (SIR-C/X-SAR) on October 5, 1994, onboard the Space Shuttle Endeavour. SIR-C/X SAR, a joint mission of the German, Italian and United States space agencies, is part of NASA's Mission to Planet Earth program.